The Canon PowerShot N100 is the follow-up to the brand's quirky Canon PowerShot N. This time round, the camera takes a more conventional form, without the unusual symmetrical chassis and shutter release ring of the PowerShot N.
The new snapper features a similar fold-out screen, along with a new rear-facing camera. The idea is that you can capture your own expression while you're taking a photo - with your selfie appearing in a small box in the corner of your snap. You can also switch modes and take normal stills if you don't want to see your mugshot staring out at you from your photos. Available in black or white, the N100 sports a neat design, which is more rectangular than the older, squarer PowerShot N. There's also a comfy thumb rest on the back to give you a little extra grip. As on the Powershot N, controls are kept to a minimum - but you'll get a conventional top-mounted shutter release button this time. There are dedicated buttons for linking up to your mobile device, playback and a favourite button to flag photos in your albums. There's also a mode switch for toggling between standard mode, taking simultaneous front- and rear-facing pictures and video mode. The camera has a 5x zoom lens with Intelligent IS and packs a 12.1 Megapixel 1/1.7-type high-sensitivity CMOS sensor. The new Story Highlights mode automatically creates video montages of your snaps by theme, date or faces - not unlike the HTC One's Zoe mode. While this may appeal to some, we can't imagine ever having a need to use it. Built-in Wi-Fi means that you can upload to all the usual social networks, while NFC means easy connection for Android devices. This means that you can also use the Canon CameraWindow app to remotely control the camera from your phone or tablet screen. The 3-inch screen can be tilted upwards to an angle of 90 degree making it easier to shoot from awkward angles. The touchscreen operation makes it easy to scroll through menus and also to move around the rear-facing mugshot (it can be placed in any of the four corners of the shot). While you can take standard snaps, the main attraction here is pictures with a tiny thumbnail of the rear-facing shot in the corner. The ones we took were fairly effective, although we can't help but feel that you're more likely to get a snap of yourself gurning with concentration while trying to line up a shot rather than smiling at the important event that you're taking a photo of. There are also 46 creative modes to play with including the usual suspects such as monochrome. 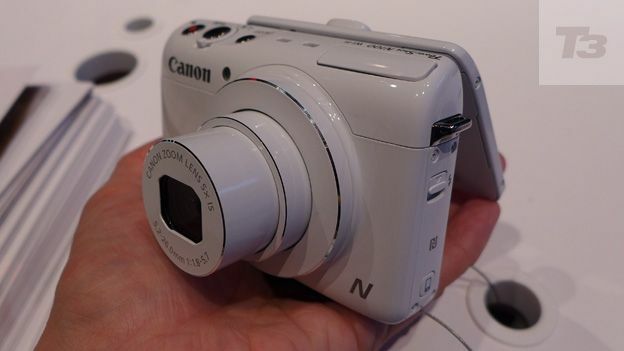 The Canon PowerShot N100 is clearly aimed at the selfie-loving market and it's a neat idea. And we like the fact that it can be operated like a normal camera, unlike the slightly annoying PowerShot N. Stay tuned for a full review.